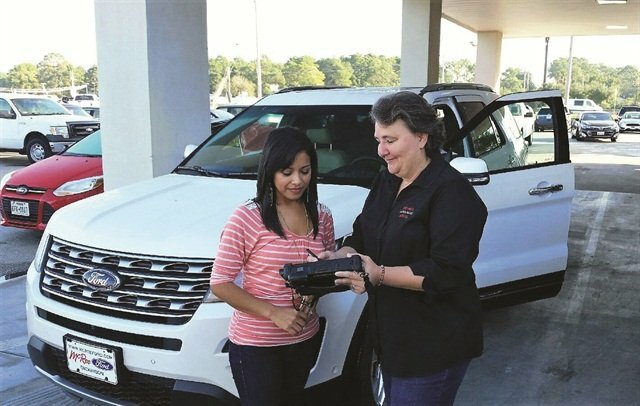 Bay Area Auto & Truck Rental in Dickinson, Texas, uses a Windows-based tablet computer with a magnetic strip and barcode reader. The computer logs into a mobile version of TSD’s Rental.Net management system software and communicates via Wi-Fi. Photo courtesy of Bay Area Auto & Truck Rental. We call this edition of Auto Rental News the “Mobile Issue.” When it comes to mobility and car rental, the first thing that comes to mind is the renter’s ability to initiate and manage his or her reservation on the go, from a smartphone or tablet. But the mobile revolution is also transforming car rental from behind the rental counter. From managing fleet using geolocation and automating check-in, to buying and selling at auction from a smartphone, mobility and automation solutions are making life easier for car rental operators. The word “geolocation” has been in our lexicon for less than a generation. But it’s actually an ancient art form — before the advent of maps, travelers would triangulate their position based on the stars. Geolocation means identifying the geographical location of a person or device using digital information, usually through a combination of GPS, cellular towers and Wi-Fi. The located device is most often a smartphone, which has quickly transformed into the tool that connects to today’s business universe. For car rental, geolocation has some powerful implications that only recently have begun to be tapped. The concept is at the heart of “on-demand” (or self-service) car rental, which blends carsharing technology with the traditional car rental model. This new model automates and decentralizes the car rental process — the rental fleet is placed virtually anywhere, free from the traditional rental lot and instantly accessible by renters on their mobile devices. In traditional rental, geolocation is used to track vehicles via GPS systems, or telematics systems in today’s parlance. While these systems traditionally handle fleet security, today they are being used increasingly to more precisely manage fleet movement to anticipate rental returns and checkouts (see separate story on page 22). The next step — for traditional rental, carsharing or on-demand car rental — is to use vehicle location with other data for better fleet management and to expand sources of business. Location data could give insight into renters’ travel patterns, which would inform marketing strategies and enhance relationships with affinity partners. Geolocation can also be used in customer-facing applications; for instance, an app that populates real-time rental rates on a smartphone map would allow renters to make decisions based not only on price but also proximity to the rental location or vehicle. The traditional rental process begins and ends with entering data manually from the renter and the vehicle. New tools are helping to automate these procedures. When the customer enters a rental office and hands the agent a driver’s license, instead of manually keying in the renter’s information, agents can use a scanner that pulls information directly from the magnetic stripe on the license to populate an electronic rental contract. The customer signs an e-signature pad and the contract is emailed with a keystroke. The rental return process is being automated by systems that electronically send information needed to finalize the rental, such as odometer and fuel gauge readings and vehicle inspection reports. Linear-Logic’s Check-In Express is one such system designed to automate check-ins. “People can get the car pretty easily during checkout, but the check-in process still requires someone to be there; it’s not quite as automated as the checkout process,” says Ron DeLong, owner of Linear-Logic. The system uses a device that plugs into the OBD-II port in each vehicle to transmit rental information over Wi-Fi such as distance driven, fuel used and fuel gauge level. The system can also detect if the car was hit with enough force to cause body damage or other events such as a cracked windshield and device tampering. This information feeds directly into the rental management system to automate the calculation of the customer’s receipt. The system can send a text message to an owner or manager upon vehicle check-in. It can also be configured to generate a text to a customer with instructions, which would come in handy for situations such as afterhours returns, says DeLong. “[The customer doesn’t] really need to talk or interact with anyone at the rental company,” DeLong says. 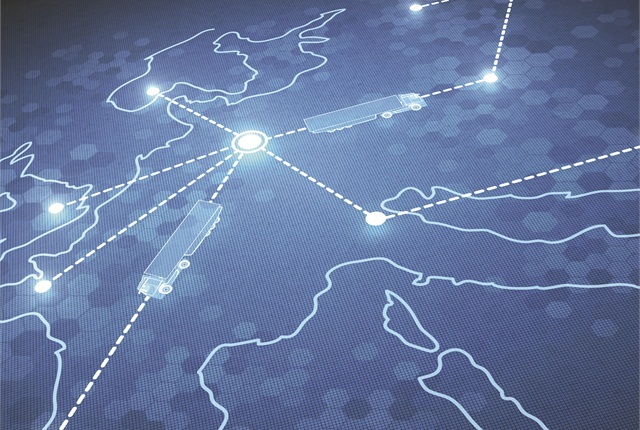 GPS tracking systems have been used in fleets for 15 years, though the systems are installed as an aftermarket product. Though telematics have obvious benefits for car rental, the hassle of installing and uninstalling the devices is a significant barrier to implementation. But what if the system came direct from the manufacturer? This is beginning to happen in the commercial fleet world. Telematics provider Telogis has partnered with General Motors and Ford as well as truck makers Hino, Mack, Isuzu, Volvo and Freightliner to install its hardware direct from the factory. The applications are used to locate commercial fleet vehicles, measure performance such as fuel economy, speed, braking and acceleration, and monitor engine diagnostics. A factory telematics option, while not yet available to rental fleets, could expand usage exponentially. Other solutions address the problem of accurate tracking and accountability for vehicle damage. Two companies offer products that use mobile and Web-based app technology to document vehicles during the rental process. The systems, from Damage iD and Record360, use images captured on mobile devices at check-in and checkout to note and compare vehicle damage or changes on the vehicle. Record360 provides time-stamped records of vehicles at the time of check-in and checkout. Using the Record360 smartphone and tablet app, rental employees can take still photos as well as video when performing a vehicle walk-around. To document existing damage or problems, employees use the app’s touch notations. Record360's mobile app. Photo courtesy of Record360. Damage iD was developed by a team from Mass.-based Verc Car Rental (now a Sixt franchisee) that worked with ExtensionEngine, a Web and mobile software development firm. 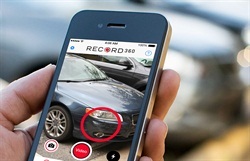 Using cameras and Web technology, this smartphone app has helped Verc recover hundreds of thousands of dollars in vehicle damage costs and eliminate pencil and paper condition reports, according to J.P. Vercollone of Sixt Boston and Damage iD. Both tools can be used to snap photos of the fuel gauge and odometer before renting out the vehicles, potentially reducing customer disputes involving fuel levels or miles driven. The mobile revolution has also extended to buying and selling cars. Using Manheim’s mobile app, clients can research vehicles, place bids and buy vehicles online, while sellers can use the app to take photos and list a vehicle, accept offers and view the status of cars once they are bought or sold. Photo courtesy of Manheim. Manheim’s mobile app and mobile-optimized website allow clients to conduct auction business on the go, from the physical auction to the online marketplace. “We have seen an evolution of how mobile has made auto rental companies’ lives more efficient,” says Rumon Lasker, Manheim’s director of product management. At Manheim’s 60 physical auctions, clients can research vehicles by scanning a vehicle’s VIN or QR code on their smartphone to access a Manheim Market Report (MMR), a condition report or a link to Carfax. Clients can also juggle auction bids more effectively. “If you are standing in one lane and want to buy a car in another lane or at another auction, you can do so using the Simulcast feature,” Lasker says. 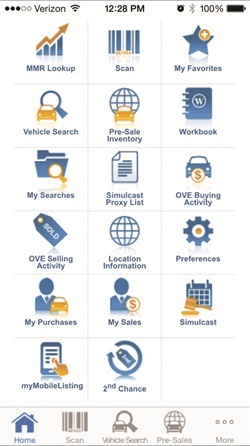 Independent of the physical auction, clients can search for vehicles by location, place bids and buy vehicles on OVE, Manheim’s online vehicle marketplace, as well as participate in live bidding via Simulcast. Sellers can use the app to take photos and list a vehicle, accept offers and view the status of cars once they are bought or sold. “It’s all about efficiency and not missing a car from a buying and selling perspective, no matter where you are,” he says. While the established car rental management systems have robust cloud-based mobile interfaces to manage car rental operations on the go, an upstart system from Belgium purports to go beyond traditional rental management systems to control the fleet from cradle to grave. The system, ivips Rental from ivips fleet management, acts on the level of enterprise resource planning software with a suite of integrated applications, which control customer and driver management, vendor invoicing, damage claims, vehicle tracking and data and more. The system automates various stages of the rental process. During checkout, the system uses scanners to pull information from the driver’s license to populate the rental contract. At check-in, the telematics module pulls odometer and fuel level readings from the vehicle when it enters the lot and sends the information directly to the contract. For renters that incur fines from traffic violations, the system can automatically interface with the renter and transfer the renter’s data to the ticket-issuing authority. A telematics module monitors real-time engine data to warn of potential breakdowns and can also analyze renters’ driving behavior. Vehicle location data can be combined with other data, such as customer information, to aid in marketing and customer retention. Another module, under development, will calculate a return on investment on every rental vehicle at any moment. The module is designed to combine capitalized costs with revenue per day, rental rates on each vehicle, depreciation and vehicle values mark to market. “[The module] would allow operators to understand when vehicles should be sold and at what margins, which would help define rate management strategies for each vehicle,” says Frederik De Witte, chief financial officer for ivips fleet management. While the ivips Rental system is designed to manage the entire process, it can connect to existing platforms, adds De Witte. The company, a division of McRee Ford, wanted not only to improve the process from a customer perspective but also in terms of fleet management. “As we are in the process of building a new dealership, it became even more important to have visibility of the status of all our vehicles throughout the whole organization, from the counter to the fleet manager to the owners,” says Marcus Lindsey, commercial business development manager. The solution uses a Windows-based tablet computer with a magnetic strip and barcode reader. The computer logs into a mobile version of TSD’s Rental.Net management system software and communicates via Wi-Fi. TSD’s mobile app gives users access to signature capture technology, scanning vehicle inventory and emailing and storing rental contracts. Upon return, agents can use the tablets to take photos of potential damage, which are automatically imported to the local server. The system can also send receipts to Wi-Fi-ready printing devices. The retail team uses two devices to check in vehicles, while the commercial team uses a device for vehicle inventory and updates. The company is in the process of making system changes to launch the fleet management functionality.